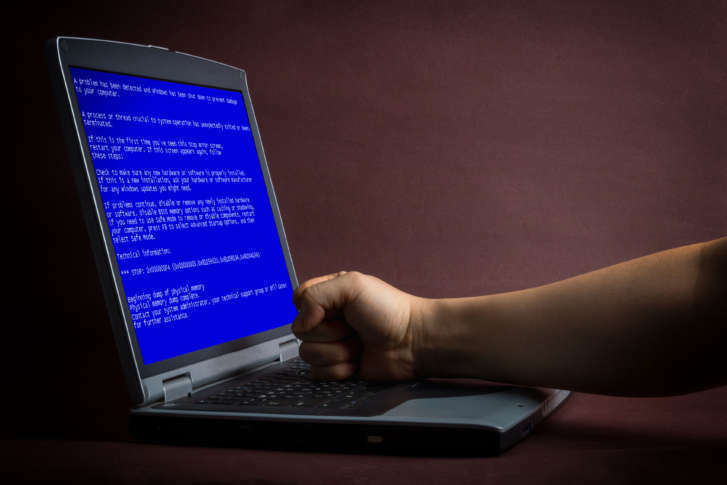 The Blue Screen Of Death, also known as the "BSOD," is among the most frustrating and potentially complicated issues that a Windows user can ever face. Q: My computer is locked up with the dreaded Blue Screen Of Death after it installed a Windows 10 update, so what do I do to get my computer running again? A: This scenario, the Blue Screen Of Death, also known as the “BSOD,” is among the most frustrating and potentially complicated issues that a Windows user can ever face and even for seasoned technical experts, it can be very time consuming to resolve. When you experience a BSOD, it’s essentially Windows telling you that it’s detected a serious problem that makes using the operating system too unstable, which is why you get stopped in your tracks until it’s resolved. The causes for a BSOD are numerous and can range from a faulty hardware component such as RAM or hard drive issues to driver conflicts in older programs to major corruption to the OS from malware, among dozens of other possibilities. One of the reasons that resolving BSOD issues can be so complicated is that just about every computer on the planet has a unique combination of hardware, software and program settings that comes into play. Generally speaking, you should see some type of stop code that helps narrow down the problem as Microsoft has over 350 stop codes that could come up on either a blue or black error screen. The complete list of Microsoft’s stop codes can be found at Microsoft’s Bug Check Code Reference. Microsoft attempts to help users with an interactive troubleshooting guide, but if things are really a mess, their generalized suggestions may get you nowhere. If you can decipher the meaning of the stop code through Microsoft’s list, you may be able to find a path for troubleshooting, but in some cases, the stop code is pointing at the results, not necessarily the cause. You also can try doing an internet search for your specific stop code as many thousands of resources exist for this all-to-common problem. We’ve seen a significant uptick in the number of computers being brought to us stuck in a BSOD loop and we suspect that in Microsoft’s rush to patch the recent Meltdown and Spectre flaws, their normal process of testing the update was compressed. Microsoft is now pushing out the Fall Creators Update to all machines on a staggered basis automatically. We do know that if your anti-virus program has not confirmed that it’s compatible with the Jan. 3 “flaw” update or if your computer has one of the AMD processors that has a known issue, Microsoft won’t offer you the update. If you don’t see the update being available, you should not try to manually install any updates, as that could certainly lead to a nightmare BSOD situation. Since both the flaw patch update and the Fall Creators Update are being automatically installed, the possibility for anyone to experience this problem goes up. With this in mind, if you haven’t performed a complete backup recently, now is the time to do it as in some severe BSOD cases, reloading everything from scratch is the only reliable solution. You’d be wise to gather all your software product keys as well in the event reinstallation is necessary, which can be done with the Belarc Advisor. Ken Colburn is founder and CEO of Data Doctors Computer Services. Ask any tech question on Facebook or Twitter.